In the closing decade of the 12th century, William I, ‘The Lion’, King of Scots (1165-1215) built his royal castle at Ayr in the bailiery of Kyle, on the south bank of the River Ayr, near the river mouth. The settlement that developed along side the castle was created a royal burgh in 1205 by royal charter at Lanark. 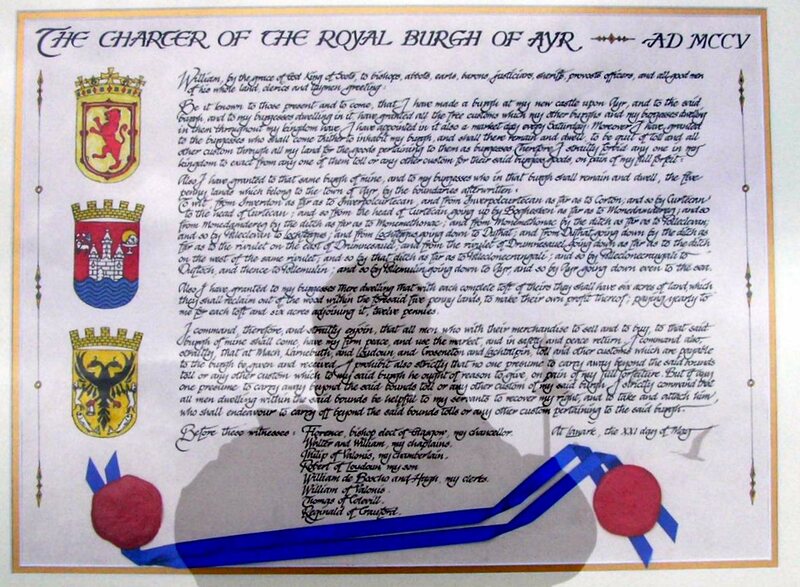 A replica of that charter was created in 2005 and brought by horse and rider from Lanark to Ayr as part of the marvellous ‘Ayr 800 years’ celebrations. William I established the royal burgh at Ayr in order to develop overseas trade and much needed revenue. 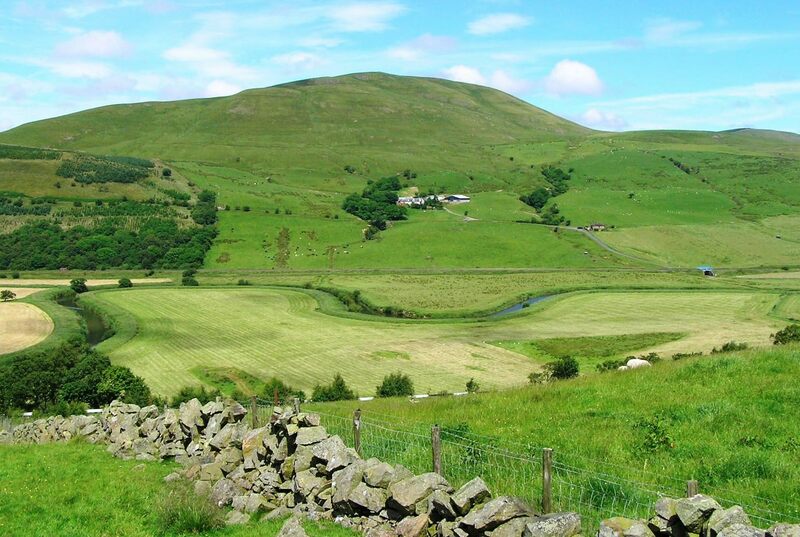 Tofts, or homesteads, comprising six acres of land within the royal burgh were offered to new settlers at an annual rent of twelvepence. Privileges for these new burgesses included weekly Saturday markets and freedom to trade without interference. Merchants visiting the markets to buy local goods such as wool, cloth, hides and cured fish or to sell their own wares were guaranteed a safe conduct under a royal seal of approval. 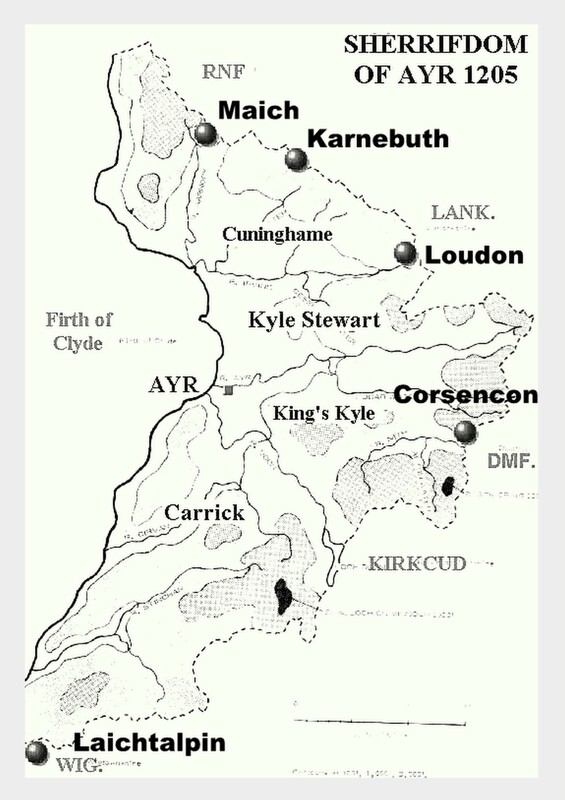 The royal burgh also enjoyed privileges within the broader trading precinct of the newly constituted sheriffdom of Ayr, created by William I, through the amalgamation of the bailieries of Cuninghame, Kyle ( Kyle Stewart and King’s Kyle) and Carrick. Ada, one of William I’s natural daughters married Patrick, 1st Earl of Dunbar and it was perhaps through this union the Dunbars would later become Barons of Cumnock, with their baronial seat at Cumnock Castle on the hill overlooking the meeting place of the Afton Water and River Nith. ‘Grants his firm peace to all merchants coming to buy and sell at the burgh of Ayr and commands that toll and custom due to the burgh shall be given and received at Maich, Karnebuth, Loudon, Corsencon and Laicht. No toll or customs belonging to the burgh is to be taken outwith these marches’. 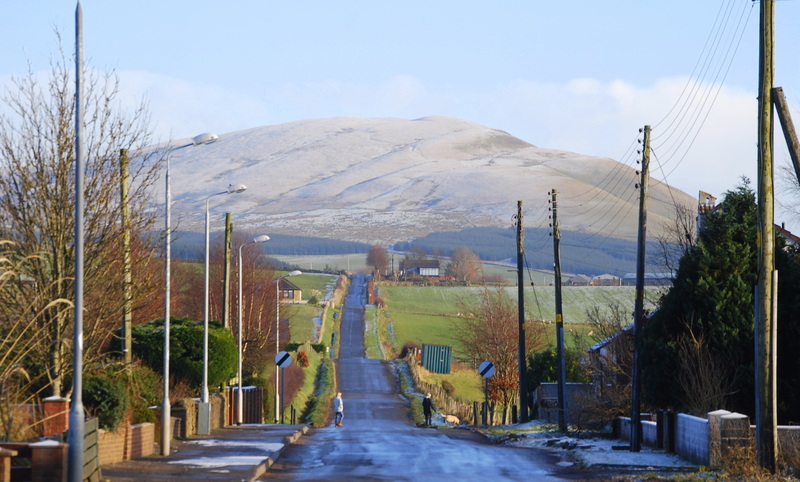 Corsencon hill is situated in the east of the parish overlooking the meandering River Nith as it leaves Ayrshire and heads for Dumfries almost 40 miles downstream and from there onto the Solway Firth. Nithsdale forms a natural route from the south into Ayrshire and today the Nith at Corsencon is straddled by the A76 trunk road on its south bank and the Carlisle to Glasgow railway line on its north bank. In the 13th century when the ‘toll and customs point’ was established at Corsencon the road cut across the back of the hill and followed a route similar to the modern day Mansfield Road on its way to Cumnock Castle, where the baron would hold the monies collected from the merchants travelling to and fro to the royal burgh.